While you and your new feline friend settle in, you’ll want to plan to visit us as soon as possible. As adorable as new kittens are, it is not uncommon for them to carry some not so endearing companions with them such as worms, fleas, and ear mites. Since intestinal parasites can be transmitted to humans as well as other animals in the household, you’ll want to address any infestations as soon as possible. In preparation for your appointment, please download a copy of our Vaccinations and Basic Preventative Health Care for Your Cat or Kitten. We’ll review this document with you to decide which vaccinations are appropriate for your newest addition. ANY previous medical history, i.e. vaccines, deworming, etc. Some statistics say one in three animals go missing in their lifetime. 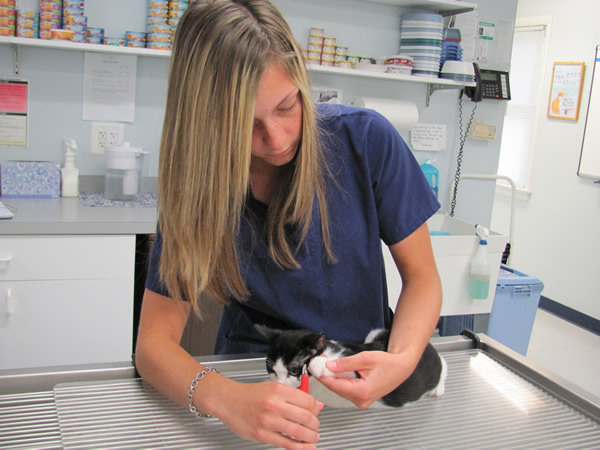 For many with indoor cats, they wonder why their cat would ever need a microchip. No matter how closely you watch your wily feline, there’s always a chance that he or she can get out—a missing screen, a careless guest or handyman, or even a natural disaster. We recommend that you microchip your kitten (or adult cat if not already done). We offer the Home Again microchip and pet recovery service, one of the leaders in the industry. As you are getting to know your kitten, you will likely have questions about nutrition, toys, and various behaviors such as play biting and scratching. We are happy to take the time to discuss these cat care issues with you. 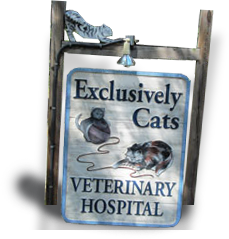 We are passionate about felines and want our patients and their families to enjoy a lifetime of happiness together. Please don’t hesitate to contact us with any questions you may have about your new kitten.